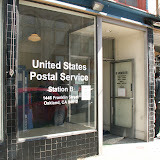 The Station B Post Office, at 1446 Franklin St, Oakland, CA 94612, closed today. I wanted to take some pictures of it before it did. To be honest, given where the USPS is financially and that there is another post office less than half a mile away, I really can't blame them for closing Station B. There are much more important and impressive post offices being closed in other parts of the country. Still, I'll miss the convenience of it, and more importantly, I love the walls and woodwork inside. I wish I could think of some business that could use the space intact, but I can't -- I can only hope it gets to a reuse center rather than being junked. Thanks, Station B. I'll miss you. If you don't like the oh-so-cool slideshow, here's a link to the Picasa album itself. I work for AC Transit, where I am responsible for a series of projects relating to public information, including our maps, our at-stop schedule program, our other bus stop signs, and so forth. As such, I created a few months ago a Google Code repository for them. Today I posted a description of the at-stop schedules, one of the more important parts of the Actium system. Anyone interested in exemplary Perl should probably look elsewhere, but I am working on it, and I do believe at some point it may be useful for people. I am moving Write Only Memory to Blogger, instead of hosting it with my current web provider (webhostingbuzz.com). We'll see how it goes.